Above, a happy Daniel Cox proudly sports his single-Windsor and the V3 Walnut. It is a rare public appearance for Daniel, who normally toils deep within the nocturnal underbelly of Alabama,where he steadfastly avoids bovines, yet stays busy devising strange and unusual things to spring on a unsuspecting, sleeping world. The Remington V3 12 gauge has been shipping for over a year in quantity. 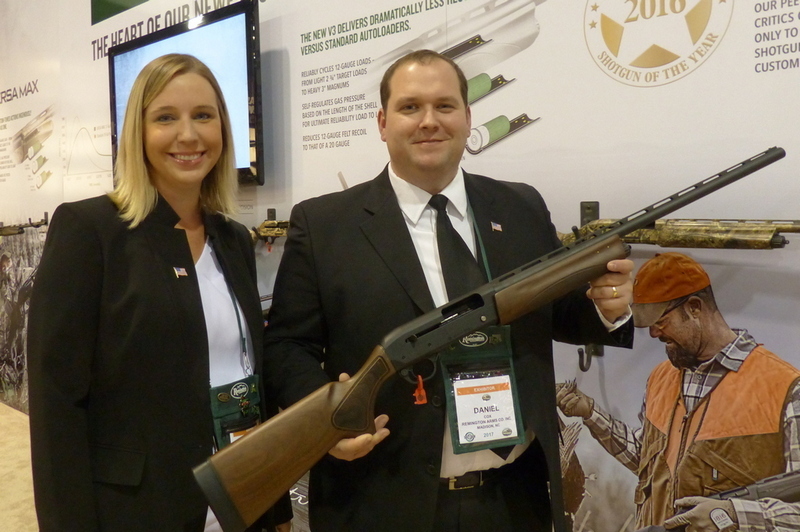 It is the first autoloading shotgun ever made to have a written lifetime warranty from day one. All models of the V3 are Made in the USA, in Ilion, New York. The basic black version sells for as low as $657 street price, with the camo and walnut models going for as low as $734 street price. Currently, 26 inch and 28 inch barrels are available. Individual dealers are naturally free to set their own pricing as they wish. Originally, the torque value for the compensating plugs of the synthetic V3 was set at 100 inch pounds. Remington no longer torques the comp plugs to 100 in./lbs. at the factory. A few early complaints from the field about how difficult factory fresh comp plugs could be to remove caused Remington to re-evaluate the torque setting to improve their consumers' experience. They decided to test and re-evaluate and found that 30 inch/lbs. was sufficient to keep them in place and make them much more user friendly in the event that a consumer wished to remove them and clean / lubricate on a factory fresh shotgun. 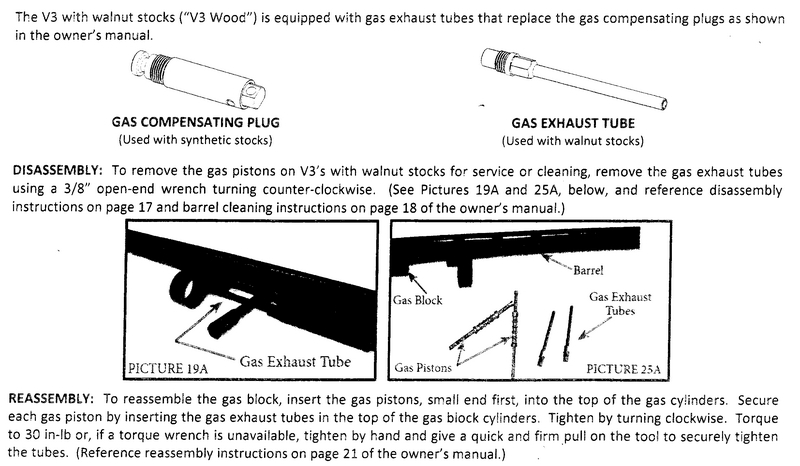 The walnut V3 model exhaust tubes share the 30 in./lbs. specification. Those wishing to lengthen the length of pull on their V3 synthetic can use the Versa Max kit, Remington #19473. For all models of the V3, the correct scope base is the same base as the Versa Max base. The black synthetic and camo models of the V3 run about 7-1/4 lbs., the walnut about 7-1/2 pounds. I personally like the 26 inch barrels and actually would prefer a 24 inch for flushing game use and for the turkey blind. 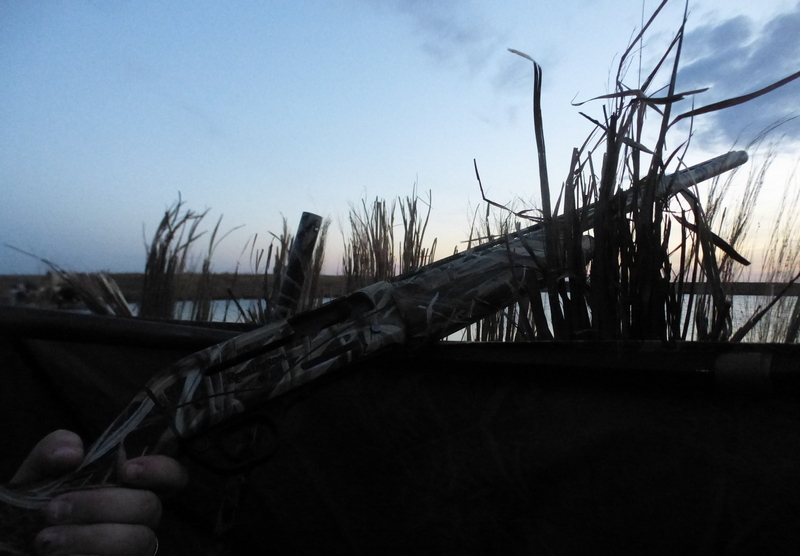 For clays, the duck blind, or the goose pit . . . you may well prefer the 28 inch barrel: that's all up to you. The V3 has an 8.36 inch receiver length, shorter than some, but that is still about 8 inches added to your sighting plane length, roughly equivalent to that of a 34 inch O/U with a 26 inch barreled V3. The V3 is not available in left hand eject models and no adjustment shims are supplied or available. As far as left-hand eject models, shim plates allowing for drop, cast, length of pull spacers, and your choice of three comb inserts, the Remington Versa Max already has all of this. Beyond that, the VM is also available in (at least) nine different models, including tactical, rifle-sighted turkey models, etc. The Remington customers that appreciate the Versa Port action already have everything available to them, right now, along with 3-1/2 inch unfolded length shell capability as well. Of course, the Remington Versa Max was introduced in 2010 and had the benefit of a goodly amount of time to more fully populate the line than the one-year-old V3. All models of the Remington V3 come with the SuperCell recoil pad, which, in conjunction with the V3 action and the VersaPort gas system, makes it the softest shooting autoloader I've ever tested in its respective weight class. There is no mainspring or mainspring tube in the buttstock of the V3. Future stock options are essentially unlimited in scope due to this. As a practical matter, there is no mainspring in the buttstock to fill with crud, no recoil tube that could crack or bend. As the V3 VersaPort action bleeds gas right off the chamber, barrel length has no effect on the function or reliability of the action. Actual cleaning of the gas piston chambers is not necessary at all in a typical hunting lifetime. Remington publishes a 2000 round cleaning interval: that's a lot of pheasants or ducks, to be sure. The fit and feel is very similar (but not identical) to the prolific Remington 870 slide-action. The V3 is a quarter pound or a half pound heavier, depending on configuration. Both the synthetic and the walnut Field Sport V3 models have slight palm-swell pistol grips. As mentioned prior, all current V3 models come with three Briley-manufactured Remchokes: IC, Mod, and Full. Unlike most shotguns on the market, the “Full” choke is steel-shot and tungsten-shot rated. As far as I'm concerned, the Remington V3 is the best value in autoloading shotguns today, comparing favorably with several autoloaders selling at street prices from $1200 - $1400 or more. The V3 is softer-shooting than all of them, has a better warranty than all of them, better factory chokes tubes than most of them, a better safety than most of them, and a better trigger than most of them as well. That the camo or walnut V3 models can be had for as low as $734 as of this writing makes the V3 an irresistible choice for those who would like some cash left over to squander on food and shelter . . . or, at least more ammunition. Several other models, options, and configurations are no doubt in the works but Remington has not released any specific information on them at this time.